We don't have any trips to Israel at the moment . When it comes to deciding what to eat in Israel, you need to bear in mind that the country itself is a mosaic of cultures and religions. This fact means that the typical dishes of Israel are very varied. However, we are going to run through the most popular food from Israel. Of all of the typical dishes you can try from Israel during your trip, the ones that continue to be the best-known are those you must try. Vegetable salad is a dish eaten with most meals, also in the traditional breakfast of Israeli cuisine itself. Breakfast includes eggs, bread and some dairy products such as yogurt or cottage cheese. For lunch or evening meal, a salad is served which is known as hummus chip salat, with chips served in pitta bread. Although pitta bread is Arabic, it is widely eaten in Israel, not in vain, since this country hosts a large Arabic community. It is made from wheat flour, olive oil, water, and salt. It is baked and served as an accompaniment to many dishes. This typical dish of food from Israel can be served at any time of day. It is made with a semi-circular dough filled with a purée of chickpeas, fried onion, and herbs. Meat can also be added, and for the breakfast version, it is eaten with feta cheese. As a snack, Torshi is one of the typical dishes of Israel that you have to try. It is pickled vegetables which include cucumber, cabbage, aubergine, carrot, radish, capers, olives, cauliflower, tomatoes, chili and beans. A treasure for vegetable lovers. Shakshouka has been a typical dish to eat in Israel since the 1950s. It consists of a dish of poached egg in spicy tomato sauce, with cumin and paprika. You can also find a variant of this in Tunisia with the name Chakchouka. This dish is served as an accompaniment to many meals in Israel. It is a dish of lentils, that can be substituted by rice, wheat or bulgur wheat, with fried onion and olive oil. Its flavor is exquisite, and you can eat it hot or cold. Almond soup or Shkedei Marak, is a chicken soup to which coriander and lemon juice are added. Another traditional soup is the traditional Israeli lentil soup, made with many alternatives with or without meat. Freekeh is an excellent option for rice lovers, it is a dish made of greenish color wheat. It is also known as green rice, the trick is in the spices and the onion, which give it a delicious flavor. Also accompanied by white rice is Orez Shu’it, a dish belonging to the Sephardic Jews, which is made with white beans cooked in tomato sauce. This dish is typical of Jerusalem. 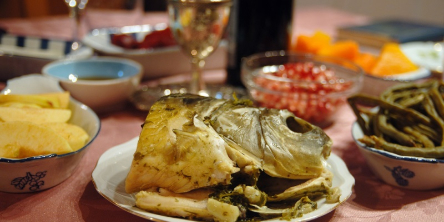 If you like fish, Jraime is one of the best-known typical dishes of Israel. In fact, it is what is eaten during Shabbat, each Saturday. It consists of a dish of chopped fish with tomato sauce, which also contains garlic, olive oil, and spices. You can find the fish fried or grilled, and it is seasoned with lemon juice. Another version is baked fish with vegetables, which is served with different spicy sauces. As well as the aforementioned main dishes, below you have other delicacies that you must try if you travel to Israel. If you like pickles, Amba is one made of mango, vinegar, salt, curcuma, and hot chilli. it is one of the dishes to eat in Israel accompanied with falafel or also as a sandwich or Sabich. This simple sandwich forms part of Israeli food and stands out for its ingredients. Fried aubergine, boiled egg, and parsley are placed in a pitta bread, which is served with hummus, amba or tahini. For cheese lovers, Labneh is perfect, it is creamy cheese made from goat or cow's milk. It usually forms part of the typical dishes of Israel for breakfast, although it can also be eaten at any time of day. Amongst the things to eat in Israel, sweets must appear on the list, on this occasion Bourekas are puff pastry filled with potato. Their simplicity doesn't detract from them, they have a truly exquisite flavor. But it doesn't end there, Sephardic confectionery is appreciated around the world. Apple cakes with cinnamon, date cookies, Jerusalem Kugel, jelly doughnuts, cheesecake and so much more. Now you know what to eat in Israel, you can plan your trip bearing in mind that Israeli food will take your palate on a journey through numerous flavors and textures. Get organized and try what attracts your attention the most! For those with a sweet tooth, Jewish sweets are the jewel in the crown of traditional confectionery, don’t hesitate to try them. If Israel has caught your attention, leave us your number so we can call you to discuss the voyage that awaits you.